Just as I was thinking I understood the full range of depression’s impact on my life, I started finding out about links between the mood disorder and some nasty physical problems. I mentioned in this post the prevalence of pain among depressed people seeking treatment from their regular doctors. But depression can do a lot more to your body than inflict pain. It has been linked to coronary heart disease, congestive heart failure, diabetes and loss of bone mineral density. The link between the mood disorder and physical impacts, however, isn’t a simple matter of cause and effect. Some physical problems, like chronic pain, may be symptomatic of depression, although it’s not yet listed among the formal diagnostic criteria for a major depressive episode. When depression appears along with cardiovascular disease, congestive heart failure or diabetes, on the other hand, the relationship is not that of symptom to illness. Instead, depression coexists, or in medical terms is comorbid, with independent diseases. It can be a risk factor for the future onset of those conditions, and depression may have the same neurochemistry that causes them. Here are a few of the facts and theories emerging from recent studies. The most common physical complaints that depressed people bring to their primary care physicians are pain, gastrointestinal problems and sleep disorders. The leader of the pack is pain. It comes in many varieties that relate to depression. Chronic back pain, joint pain, arm and leg pain, especially when they seem to have no explanation, are high on the list. In fact, the presence of pain and other physical symptoms that seem to have no cause makes it all the more likely that there is an underlying mood disorder, most often depression. Why does pain, in particular, so frequently appear with depression? Neuroscience researchers have looked closely at the link. Apparently, there’s an overlap between pathways in the nervous system that help bring on both pain and depression. The neurotransmitters, serotonin and norepinephrine, familiar as the targets of antidepressant medication, also contribute to pain. The evidence seems to say that reduced levels of these hormones can result in both pain and depression. Unfortunately, treatment usually doesn’t deal directly with pain. However, research is finding that if those problems stay with you after you feel better and seem to be out of a bad episode, you have a greater risk of relapsing. That makes me wonder if I’ve recovered as fully as I thought, since I have my own checklist of chronic physical problems. Because heart disease is such a widespread killer, researchers have put together a lot of data about the difference that depression makes to heart patients. The findings aren’t good. If you’re depressed and have coronary artery disease, you’re twice as likely as those who are not depressed to have a major cardiac event within 12 months of the diagnosis. You are also a lot more likely to die after a heart attack or coronary bypass surgery. While a number of studies confirm those grim connections, it’s less clear why depression has these effects. One theory points to impacts on the autonomic nervous system. This is the system regulating vital functions that occur without your awareness, especially the beating of your heart. One part of autonomic system is the sympathetic nervous system. Its function is to stimulate the heart, while the parasympathetic nervous system relaxes it. Depression may increase the stimulation and reduce the relaxation of the heart muscle, and that can lead to a number of cardiac events. The neurotransmitters linked to depression could affect the arteries as well. When their levels in the blood drop, that reduction may contribute to the chronic inflammatory process that defines coronary artery disease. All studies haven’t reached the same conclusions, but the majority of them have found connections between depression and decreases in bone mineral density. That leads to osteoporosis and an increased risk of fracture in older adults. Depression is linked to elevated levels of the steroid cortisol. Too much cortisol may also affect bone metabolism and so reduce mineral density. Estrogen and testosterone production are important for bone health, and depression tends to lower the levels of these hormones as well. A third mechanism by which depression can lead to bone loss is the increased activity of the sympathetic nervous system that affects heart disease. The behavior of depressed people can also play a role. Depression is associated with less physical activity, and without exercise the body loses an important way of increasing bone mineral density. Smoking and alcohol use are both linked to depression, and both can reduce bone formation. About 23 million people in the US have diabetes, and a ten year study, lasting from 1996 to 2006, has found a link with depression. The study tracked more than 65,000 women between 50 and 75 years old. Those who were taking antidepressants were 25% more likely to develop diabetes than women who were not depressed. Women with diabetes were almost 30% more likely to get a depressive disorder than women without diabetes. If they were taking insulin, the risk of depression was more than 50% higher. There are two ways of explaining this connection. One is biological and has to do with the effects of stress. Depression tends to put people into long-lasting stress, and that results in higher levels of cortisol in the blood. That’s the steroid produced by the body to help it deal with threats and high stress situations – which can be psychological as well as external. High levels of cortisol cause numerous problems, and diabetes may be one of them. The other explanation focuses on the behavior of people with both conditions. Diabetics rely on self-care, including regular insulin injections, and depressed people often fail to take care of themselves. Diabetes can also worsen depression because it is a chronic illness that increases the level of stress and worry in daily life. Since these are also characteristics of depression, they become even worse with the added complication of diabetes. I first read about the possible effects of depression on these widespread diseases in Peter Kramer’s Against Depression . He argued that such physical effects made it all the more urgent to begin depression treatment as early as possible. Successful treatment of depression at its first appearance increases the chances of preventing the illness from becoming recurrent. And it is the continuing distortion of the body’s neurochemistry caused by repeated episodes depression that greatly increases the risk of developing other serious diseases later in life. That’s a strong motive for finding effective treatment as soon as possible. I was depressive in a long time and I met a doctor and I feel better now. The post is very good. Thanks! I don’t know if I am depressed or burned out or whatever but I have kind of the same physical symptoms as ” Sophie ” and I have started to cry a lot more than before. I find myself lost in my own thoughts and often want to just lay alone somewhere and my hobbies like writing and drawing and reading doesn’t seem to apeal to me anymore. I also find it really hard to talk to anyone about whats on ny mind. Am I depressed or what is wrong with me? I feel depressed all the time, can’t get out of it.Im at the the point where I’m so bad I can’t do much without being just really confused. IT’S so hard for me to come back to reality, people just up on me and I’m feeling like I don’t no how to come back, I need help more then I been getting for yrs now. I wish I could get rid of my “aching heart.” I have been depressed and developed anxiety this past half year on top of my depression. My heart literally aches on and off throughout the day, (I think it aches most of the day but depending on how distracted I am at any particular moment, I may notice it more or less). Sometimes the beat is really thumping and I can feel it, especially as it will wake me up in the mornings. At times, I also feel a beating on the right side of my chest as well and even right underneath my chest (or breasts), I can feel a pulsating. Additionally, I have this feeling of hollowness or emptiness from the chest down, almost as if I am hungry even when I’ve eaten. It’s so strange, I don’t know how to explain it. To complicated matters, at the same time, I feel a sense of “stuffiness” in my upper chest where I wish I could belch to feel relief, and sometimes I do actually belch and it seems to relieve the stuffiness slightly but not to the full extent that I wish. I don’t know what not feeling anxious feels like anymore. I have always been depressed to one degree or another but the addition of anxiety and nervousness has added a whole new dimension to my suffering. I have many reasons why I think my depression has worsened so I don’t think it’s strictly a chemical imbalance thing. But I don’t see any satisfactory resolutions to my problems, long term and that’s where my hopelessness really engulfs me sometimes. The “solutions” are not really anything I am happy with but I don’t have the resources, means, talent or skills to really resolve them to where I would feel any true satisfaction or contentment. So I feel so stuck. And all the while, I live each day feeling terrible and trying to put one foot in front of the other. But how long before that isn’t enough anymore? i m suffering with some depression and addicted to thinking something in day time and night in sleep also everyday from past 6 years . and i am extreamly stressed also . i am not able to give rest to my mind at all . as it goes on like that from past 2 weeks i’m feeling chest pain very much and my eyes also paining like any thing .. please suggest what i have to do ? please ? I’m feeling sad today. I just woke like that…i have moved to Canada 13 years ago and still don’t find Canada my home. I work on a job which i didn’t choose by likehood, only because of the role. I have children which i don’t enjoy for a long time. A husband who’s day to day is work and come back home to feel sad and talk to me about his ugly boss and his far away family who lives at 10 min from us and he never sees, because they don’t even care on calling. I’m tired, upset of who i have become…and i’m only 34. I have been recently diagnosed with some kind of Depression, i guess i understand what’s all about, but i can’t feel i’m going forward with my therapies. I have been off since August and can’t find an easy way to get out and play with life. I have gone to the gym, brought the dog to the park every day, talked to one of my friends about other things, trying to get rid of anyone with sadness and argumental opinions around me. I have tried to feel more comfortable with the children and play any games. Watched shows about the disease, make myself available to others, read books, …..i don’t know what else to do…. £Just never forget to tell them how proud u are of them. I take Zoloft. Helps. I think I have just found myself in these lines and I’m really happy it happened. I have some health problems but it had never occurred to me that they should be connected to our daily stress and anger. I have acute back pains, stomach ache, candidosis, I fall asleep late at night and I have also realised that I’m not so pleased with myself/my life. While reading this article I suddenly became aware of how serious these aspects are in our life. Fortunately, I have not reached the highness of these diseases, but I was making rapid progress towards them. It is so easy to write down our problems, to be aware of the fact that we are really affected by them and it is so hard to leave talking and begin acting…There is a huge difference. This is my real concern. Thank you very much for the information. It helped me a lot. Life’s hands you difficulties so you can learn from them. People who have really easy lives fall apart when bad things happen because they have never learned how to cope or let things roll off their backs. 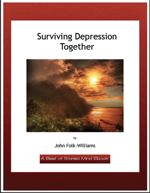 Everything, even very Depression, can be used to learn better coping skills and to develop wisdom and perspective about life that will help you deal with many difficulties in the future. Whatever doesn’t destroy you can serve to make you stronger. Although I like the sentiment, is it wishful thinking? Since the first breakdown, I have started to feel more fragile and prone to cracks. Having suffered from mental illnesses all my life I can see how it has affected my physical health. I had no idea that there was such a link between depression and diabetes and heart disease. I was diagnosed with diabetes nearly 5 years ago when I went into the emergency room with a blood sugar of 450. About 4 years later I had my first heart attack and then again about a year after that I had another heart attack. I knew that I suffered from PTSD, anxiety and major depression but that second heart attack (and suicide attempt) was the wake up call I needed to find some meaningful help for mental improving my mental health. About two weeks out of the hospital from the second heart attack I started to call around for affordable (free) mental health resources and found none. I became so disappointed and eventually worked myself into a panic attack. Panic attack lead me back to the emergency room and I was at risk of another heart attack with pulse racing well over 120 beats per minute. From the ER I was referred to a free mental health crisis center and am doing much better after my 6 day stay. Today I eat better and exercise fairly regular. I am actually loosing weight, have practically cured my own type II diabetes and all my cholesterol levels are approaching a healthy level. The link with depression (and mental illness in general) to me was mostly that I didn’t care enough about life so I just sat around waiting for it to end. I ate one large meal before bed but nothing the rest of the day. I never exercised and refused to do even simple household chores. I had thought the cause of diabetes and heart disease was very much the mental condition but never realized how much deeper the link was until I read this post. Again thanks for this information. I’m glad to hear you’ve made so much progress with these serious health problems. I continue to be amazed at how widespread the effects of depression and other mental disorders are on the body. I guess a lot of the surprise is due to the strange idea we learn that the mind and body are separated, when they are, in fact, so intimately connected through the nervous system and the constant back-and-forth flow of information. I’ll be writing more about this soon and hope you’ll share more of your experience and insight as well. I am having unexplained body pain for more than 5 years and I am a victim of depression since last ten years. After reading your post, i feel my pain may be the side effect of my depression. I am treating it with exercise and Yoga. I am feeling better and getting better. It’s a long process, i will have to continue for ver long. I recently wrote another piece on depression and pain – fibromyalgia – but it’s in the newsletter, not the blog. I think you have the right approach. Pain that can’t be explained by any specific physical cause is often linked to a mood disorder like depression.